A call to Bill Sanderson at Edmiston & Company confirms a $500,000 price cut on the stunning 41.55m J Class sailing yacht Ranger. 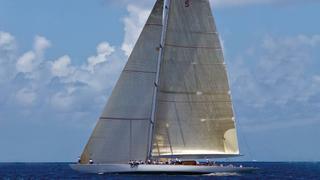 She was built by Danish Yachts in 2004 as a replica of the famed J Class yacht that won the America's Cup in 1937, her naval architects Paolo Scanu, Reichel-Pugh and Fred Elliott working with the original lines of William Starling Burgess and Sparkman & Stephens. A departure from the original, she carries a central cockpit, doghouse and luxurious mahogany interior designed by Glade Johnson, boasting four staterooms aft for an owner and six guests, with three ensuite baths. LLoyd's classed and MCA compliant, Ranger is powered by a single 425hp Lugger engine giving her a range of 1,800 nautical miles at eight knots under power. Ranger is now down from $14.5 million to $14 million.